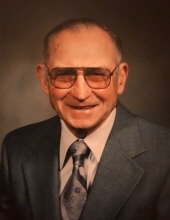 Wallace Anthony Mellott, 94 years, of Harrisonville, PA passed away on Saturday December 1, 2018 at the Fulton County Medical Center. He was born on Saturday January 12, 1924 in Andover, PA, son of the late Thelma Mellott. Wallace was a high school graduate from the Greenhill High School. He served in the United States Marine Corps from 1943 until 1945 attaining the rank of Staff Sergeant prior to his Honorable Discharge. Wallace married the late Sara Mellott on May 15, 1946. He owned and operated the family farm in Harrisonville, PA where he raised a herd of Jersey cows. Wallace had the distinction of being recognized 9 years in a row for Milk and/or Fat production by his Jersey cows and one year his herd was ranked 5th nationally for production. Wallace is survived by one son Mathern W. (husband of Marilyn) Mellott of McConnellsburg, PA, one step son James G. Blevins of York, PA, 2 step grandaughters Penelope and Dakota Blevins, one half sister Marilyn Strait of Harrisonville, PA and his companion of 18 years Janet Champion of McConnellsburg, PA.
An evening of visitation will be held on Wednesday, Dec. 5, 2018 from 6:00 PM until 8:00 PM at Kelso-Cornelius Funeral Home in McConnellsburg, PA. A funeral service will be held on Thursday, Dec 6, 2018 at 1:00 PM at Kelso - Cornelius Funeral Home. In lieu of flowers, memorial donations may be made to the McConnellsburg Volunteer Fire Company, 112 East Maple Street, McConnellsburg, PA 17233 or at www.mcconnellsburgfire.org. The family has entrusted Wallace's care to Kelso-Cornelius Funeral Home in McConnellsburg, PA. Online condolences may be expressed at www.kelso-corneliusfuneralhome.com. To send flowers or a remembrance gift to the family of Wallace A. Mellott, please visit our Tribute Store. "Email Address" would like to share the life celebration of Wallace A. Mellott. Click on the "link" to go to share a favorite memory or leave a condolence message for the family.